ZERO EMISSIONS BATTERY-POWERED ELECTRIC DUMPER FOR LOADS UP TO 500 KG High load transmission Semi automatic skip tipping Quick skip release attachment for fast replacement Direction change (forward-reverse) by lever on handlebars The DT-500 is an electric dumper equipped with three wheels, with a solid steel structure. 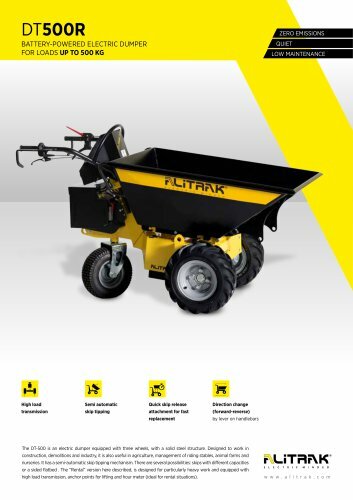 Designed to work in construction, demolitions and industry, it is also useful in agriculture, management of riding stables, animal farms and nurseries. It has a semi-automatic skip tipping mechanism. There are several possibilities: skips with different capacities or a sided flatbed . The “Rental” version here described, is designed for particularly heavy work and equipped with high load transmission, anchor points for lifting and hour meter (ideal for rental situations).